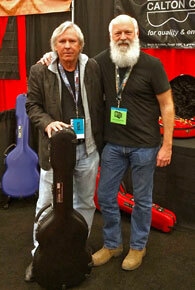 L-R James Williamson with Jon Green at 2014 SXSW. This past January at the Winter NAMM Show in Anaheim we were visibly impressed with the improvements we saw in Calton Cases. After visiting with new owner Jon Green we agreed to sit down and discuss their new home in Austin, Texas and changes to the product line. Jon brings to Calton a B.S. in Mechanical Engineering and an MBA from the University of Texas with 25 years of experience in the technology business (semiconductor, networking and software industries) and experience in finance, marketing, sales and product development. To round it all out he's a self-professed music fanatic, hobby guitar player, instrument collector and concert producer. Business partner Jeff Poss adds over 25 years of his experience in composites manufacturing with extensive background in museum exhibits and movie props. He was instrumental in the manufacture of Calton's new plugs and molds, as well as the manufacturing process and materials development and refinement. The result is a product receiving rave reviews from instrument owners, industry observers and retailers. Concerns under a previous owner have been addressed and the result is a gorgeous product built to protect the instruments we love. Long one of the great options in a case, a rebirth of greatness in the Calton line is under way. It's a win-win for all involved and we couldn't be happier to help tell the story. Mandolin Cafe: The Calton brand has been around awhile but not everyone knows the history of the company. Can you fill us in? Jon Green: Calton Cases was born just outside London, England in 1969 with Keith Calton taking on the challenge to build a guitar case for a friend. Keith went on to develop a successful business building a range of stringed instrument cases. In 1988 he licensed Al and Trudy Williams of Calgary, Alberta to build cases in North America. The European and North American business experienced a very successful run from 1988 to 2008 and the Calton brand established its reputation as the standard for heavy duty cases built to deliver the ultimate in instrument protection. In 2008 Al and Trudy sold the North American business. The transition did not go well and Calton Cases faltered in North America, while Keith continued building and selling cases in Europe. In 2012 I got in touch with Keith while looking for new latches to repair a case for a friend. I proposed a new license arrangement for North America, Keith countered that he was thinking about retirement and was more interested in selling the business outright. We closed on the sale in 2013 and commenced volume production in Austin, Texas in September 2013. Keith continued building cases until recently in order to facilitate a smooth transition for our customers in Europe while we ramped production in Austin. He remains with the company in an advisory capacity for the foreseeable future. Mandolin Cafe: The new mandolin cases have similarities to the older models. Is it true you retooled the entire construction process? Jon Green: We have updated both the design and the build process. Keith actually put the updated model into production about three years ago in Europe. Updates to the design include a larger radius at the corners of the case and more curvature in the body, which yields a more streamlined and inherently stronger shell. Keith also widened the headstock compartment during this redesign. These improvements yield a finished case that is 10-15% lighter in weight and, in my opinion, more aesthetically pleasing. The use of a CAD/CNC system to facilitate development and implementation of future improvements. The addition of custom Calton Catch Surrounds to address the common problem of latches being broken during travel. The inclusion of an RFID chip (Radio-frequency identification) in every case, which can be registered by the owner for improved chances of recovery in case of loss or theft. Mandolin Cafe: Over the years there had been concern expressed about protection of F- and A-model instruments in older Calton models. How have you addressed that in the new design? Jon Green: I believe that this question refers to concerns over the width of the headstock compartment. This has been addressed in the new design, which has been widened by one inch as compared to the original mandolin case. Mandolin Cafe: We have our share of serious case geeks. Hit us with your best shot on the internal structure of what makes up a mandolin case, how it's made, and any other details you feel like sharing. Jon Green: Our first focus is the instrument and its well being. Everything about our cases flows from this. The two most important components of the case for protecting an instrument are the incredibly strong and rigid shell and the snug, custom fitted interior. Our shells are constructed of an outer layer of gel-coat, which gives the case its color and first level of protection, with a composite sandwich of fiberglass and reinforcing foam behind it. This construction provides for a high strength-to-weight ratio. For the interiors, we use thick foam padding covered with plush, color-fast velvet which will not bleed into the finish of the instrument. Our construction method is to custom fit the foam in every case we make. 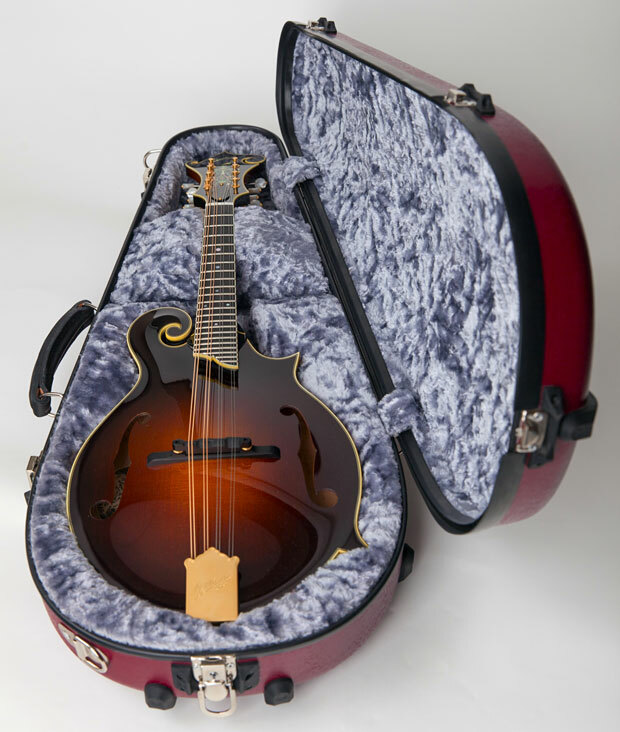 This means that we can fit the case specifically for an F-style or A-style mandolin. If the instrument is uniquely sized we can accommodate it with no special effort or extra charges for the custom fit. The snug fit provided by this process helps to ensure that the instrument is well padded and provides outstanding protection. Mandolin Cafe: You explained the external finishing process to us as NAMM. Care to share that with our readers? Jon Green: Keith Calton has been designing and building cases for over forty years now. We are thrilled to have the honor of carrying on his legacy, including continuing to work with him on further evolving case designs and features. One of the design improvements we have already implemented is an improved exterior finish. We apply an 'orange peel' texture to the gelcoat exterior for improvements in both durability and aesthetic appeal. Customer response to this new finish has been extremely positive. Mandolin Cafe: The Austin plant is still pretty new. Are you at peak production, and if not, what does that time frame look like? Jon Green: We have ramped into steady, process-driven production and have been very careful to make our processes scalable. This enables us to 'right-size' our production capacity to match demand. Our current facility can be equipped to support three to four times the volume we're currently running, and we are already thinking about and preparing for eventually expanding this facility, splitting production with a second site, or perhaps moving altogether. Mandolin Cafe: We really like how each latch has a protective area surrounding it. What was the thought process behind that feature? Jon Green: Latches are widely known as the Achilles heel for travel cases. There are endless examples of latches broken through shearing, particularly when cases are checked for air travel. Keith had a solution in development as we commenced negotiating the sale of the company. This solution consists of a hard rubber bezel surrounding each latch. The bezel is angled to deflect a blow which would otherwise damage or break the latch. After the contract was signed, we worked with Keith to complete and implement the design. The result is the Calton Catch Surround, which is now included on every Calton case made. This is yet another innovative feature designed to further enhance Calton's commitment to provide ultimate instrument protection. Mandolin Cafe: Tell us about your relationship with Colorado Case Company and your custom case covers. Jon Green: Colorado Case Company is both a customer and a partner of Calton Cases. They are designing form fitted covers for each of our cases, the mandolin case cover was one of the first to be put into production. It fits the case perfectly and is a wonderful addition to the overall protection package. Colorado Case is also an authorized Calton Cases dealer. Great to hear Calton is back in the game! To echo Paul ... Great to hear that Calton is back and that Keith is getting a well deserved rest. But .. i don't see headstock pillows under or over the headstock. It may sound like overkill ... but when i opened a Calton and found the neck split and the headstock on its way to separating i sure wish the pillows were available ... as they had been on the first Deluxe Calton i got for a '28 Gibson L-5 that Paul worked on. Great article, we here at Colorado Case Company appreciate the mention and the chance to work with such a great group of people at Calton Cases. What's the storage like? Any images of that space? I'm still enjoying my Colorado case cover 8.5 years later on my Calton case. Glad to hear they are ramping up production again if I ever "need" another mandolin. The headstock compartment was widened by only 1", couldn't it have been widened to provide a full 1" on either side of the scrolls ?. I agree with Ivan. I recently had the opportunity to try one out by placing my Gilchrist in one of the new cases. Although better than before, I was very surprised to see how little extra room the 'eastern' scroll had next to the side. Oh well. Maybe I am just lucky, or maybe the non-scrolled headstock on my Flatbush V4 eliminates the issue? So far in the almost 9 years I have it, no trouble at all. Of course I've never flown with it, but plenty of travel by land. Your mandolin is not in the 'at risk' crowd. It's the mandolins with the headstock scroll above the treble strings that suffered in the past. If the neck is held firmly at the nut, it can't move side to side. Hence there should be no problem. But I haven't seen a new Calton F case yet, nor have I ever known of significant issues with earlier Calton F-cases. The later UK made cases did address these points, with more space around the headstock (still not a lot compared to a Pegasus, mind), with full length neck support, and with denser more resilient foam. That particular case there is the earliest example of a Calton mandolin case I have seen. Pretty primitive alright. That was an English one, because there was not yet a Canadian branch in 1978. The new ones look pretty good to me. Indeed, this has always been a main requirement for me to consider any case, and Calton has always managed this aspect brilliantly, with its perfect neck cradle/support. Well, I won't re-hash the many testimonials I have known of detailing significant issues with earlier Calton F-cases. That said, I wish them well in case sales.